The sweat is in the details.... Most graphs, like many other endeavors follow the 80-20 Rule: You can get it 80% done with 20% of the effort, but the remaining 20% is hard work, and takes the remaining 80% of the effort. These are just a few images, mostly data graphics, that have caught my eye for their careful attention to graphic design and execution. Description: Newspapers and magazines usually choose simplicity over detail, because it is hard to show much information in a single, comprehensible display. A collection of truly bad examples from the popular media are shown on our Darts pages. Here, the attention to detail, and to graphic design are evident. 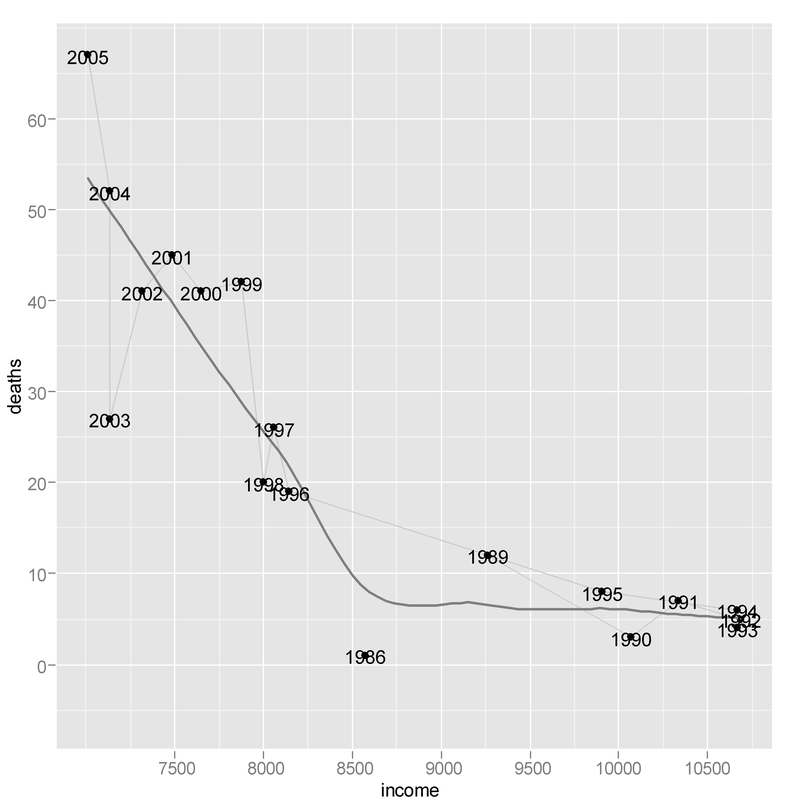 This graph, from the New York Times (Jan. 11, 1981, p. 32; Tufte (1983), p. 30) shows--- both valiantly, and sucessfully--- 2200 numbers which summarize the trends and patterns in weather in New York City in 1980. The three aligned charts show temperature, precipitation, and relative humidity. In the graph of temperature, the area is filled between the daily low and daily high. What makes this graph successful, in spite of the large amount of information presented are (a) clear visual comparisons between the 1980 data and the long-run average, (b) clear textual labels, (c) visual segregation between the three series. For example, it is easy to see that March and April were about of normal temperature, but a lot wetter. Description: The graph represents elemental concentrations of Calcium derived from least squares fit of filtered X-ray Energy Spectra - measurements taken from Cytoplasm, Mitochondria, and over the whole cell from treated and control samples. The data points are printed with jittered/randomized X coordinates, to keep them from overprinting and obscuring each other. The boxes are "standard" boxplots (using a modification of the standard XlispStat boxplot function) showing the median value, boxing the inner quartiles, and showing the max and min range. The white and gray ovals are centered around the weighted means of the data, with the vertical radius being one and two standard deviations, respectively. The thin gray horizontal line is the mean of the combined data. Description: The figure is a Trellis display of data from an agricultural field trial of barley yields at six sites in Minnesota; ten varieties of barley were grown in each of two years. The data were presented by R. A. Fisher in The Design of Experiments and analyzed subsequently by many others. The graph uses main effect ordering to arrange the 6 sites and 10 barley varieties from bottom to top according to increasing values of the median yields (collapsed over other factors). This greatly aids perception of trends in the data and makes the Morris data stand out as unusual. Description: Network diagrams are often used to show the relations between pairs of objects. Among other difficulties, it is hard to produce a pleasing arrangement of the nodes and links, and hard to use a network diagram as a data display. Krempel and Plumper used the geographic distances among 26 countries with a spring-embedding algorithm to obtain a simplistic geographical layout. 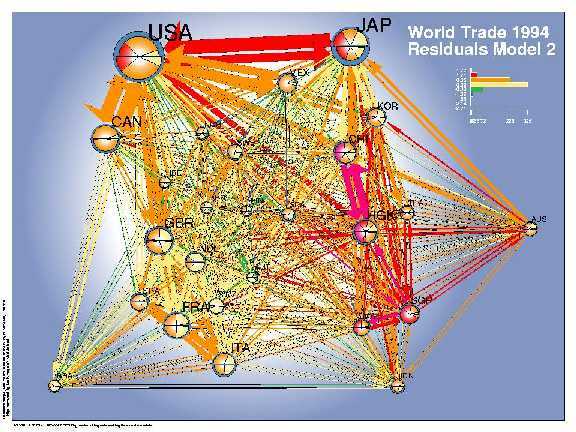 They fit a series of regression models predicting the amount of bilateral trade between these countries, and used the network diagram to show both the data (trade volume) and the residuals (errors) from a given model. 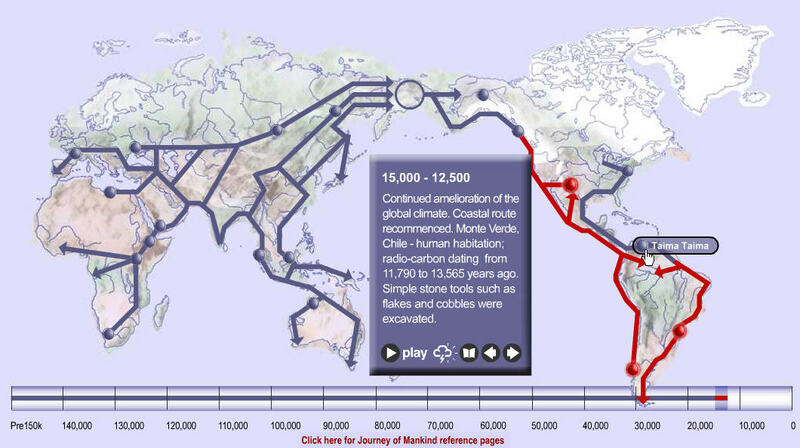 This visual procedure was used to suggest additional variables to be included into the models. 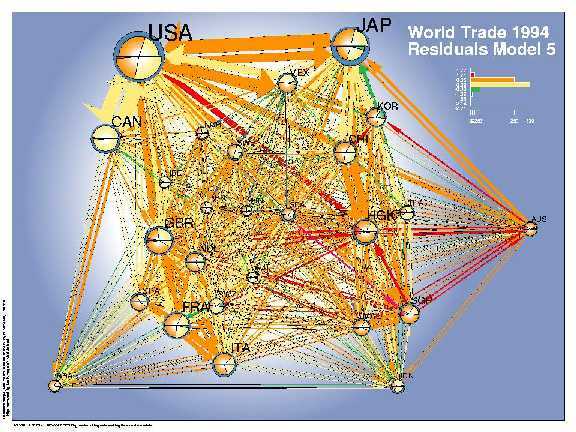 The network diagrams show the volumes of bilateral trade (sizes of the arrows) and use colors to depict the errors of a given model--- which countries trade more than estimated (orange, red) or less (green, blue). The size of the country symbols stands for their volume of trade (in $ US), the balance of trade can be read from the comparision of the imports (bottom) and the exports (top). The pie slices indicate the degree to which the volume of the imports and exports (size) of a single country are overestimated respectively underestimated (colors). Model 2, which accounts for geographical distance and the GDP of the importing and exporting countries, shows a systematic regional imperfection of the estimates for the Pacific region. An enhanced model accounts additionally for joint borders, joint oceans regional economic areas and yields an improved fit. Nevertheless one can easily detect a systematic component in the errors, which points to the importance of the former British Commonwealth (GBR - HKG - AUS) for which the trade volumes are systematically underestimated. Description: Making complex information about social and human development throughout the world available and understandable is as difficult as it is important. Gapminder is a project in Malmo, Sweden designed to produce accessible, easily used interactive software used to study trends in data on world income distribution, human health and development, and similar topics. In addition to the very nice interactive applications, the static graphs are also models of clarity of graphic design. Description: DM Review sponsored a data visualization contest related to data presentation for buisness purposes. One scenario was to create a 'sales dashboard' that highlighted aspects of poor performance for a company. This entry, by Robert Allison of SAS Institute was the winner, and a lovely example of a multi-panel dashboard display for business decision. It combines a variety of indicators in a coherently organized display: Revenue and profit, performance metrics, product (wine) type, and region, with well-designed color coding and target indicators. One can easily see that while revenue and profit were good and rising, market share was falling, as were delivery time and satisfaction, etc. See Robert's description of the approach and design for this display. 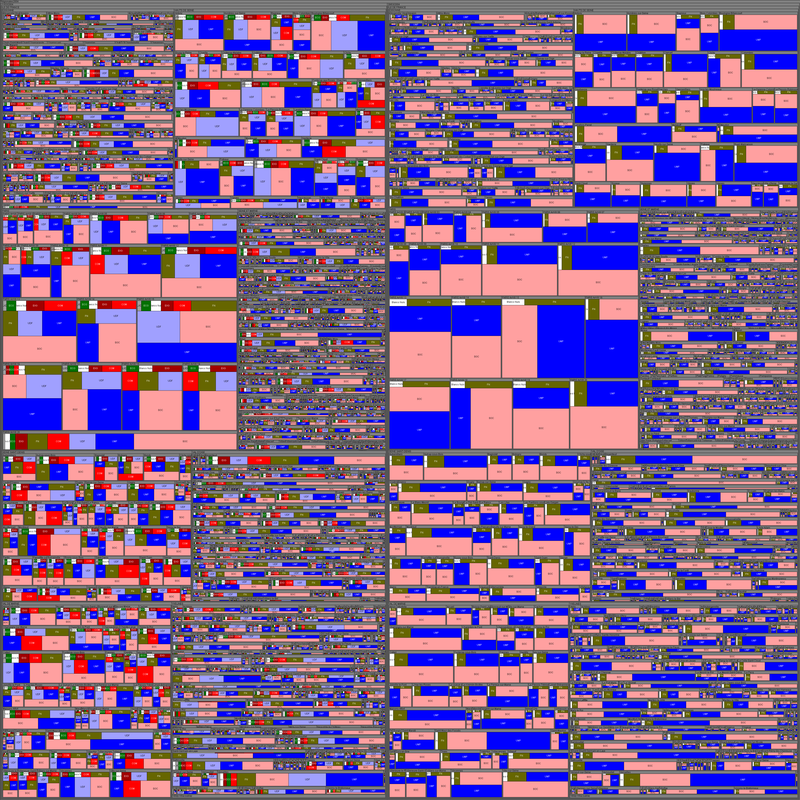 Description: Treemaps provide an ideal graphic form for visualizing hierarchical data in a compact way, using nested rectangles whose area is proportional to some outcome, and which can be colored to show some categories. This example, from French Elections 2004: Data and Visualization, by Jean-Daniel Fekete shows election results in the Ile de France region surrounding Paris. There were two rounds in the election. For each department, the left rectangle represents the first round and the right rectangle the second. These rectangles for the departéments contain the cantons (approx. county subdivisions), which contain the communes (districts), which contain the results by political party. 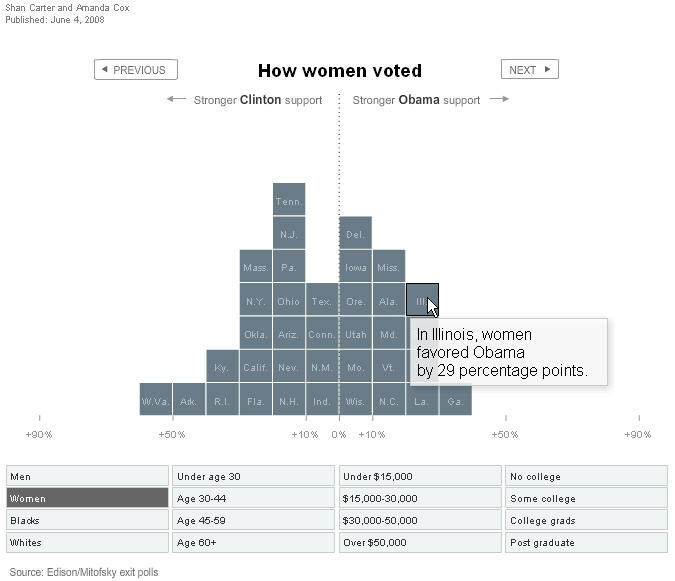 The area of each rectangle is proportional to the percentage of votes. The colors use the traditional French scheme of political parties: dark red for extreme left, red for Communists, pink for Socialists, orange for RDC, yellow for misc. left and others misc. parties, grey for misc. right wing parties, light blue for UDF, blue for UMP, military green for FN (popular extreme right wing party) and dark blue for other extreme right wing parties. White is for nul votes and black for abstention. 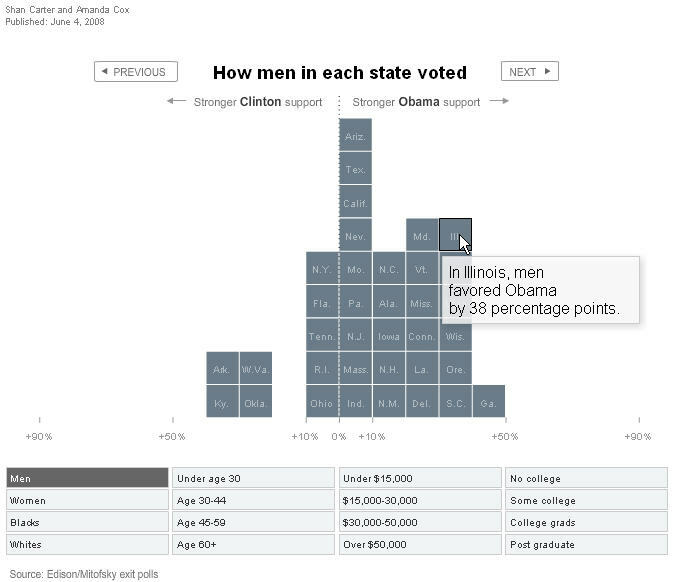 There are many fine treemap examples; I chose this one for its exemplary attention to detail and execution. What is missing in this static view is the ability to zoom in and out dynamically, dividing or aggregating hierarchical levels for communes, cantons or departéments. Howard Wainer, who alerted me to this called it, An impressive use of dynamic display to convey a complex story -- or at least the start of one. It is easy to see how more information (e.g. total population size) could be added to enrich the picture, nevertheless although it is a short step from Minard, it is a worthy successor. 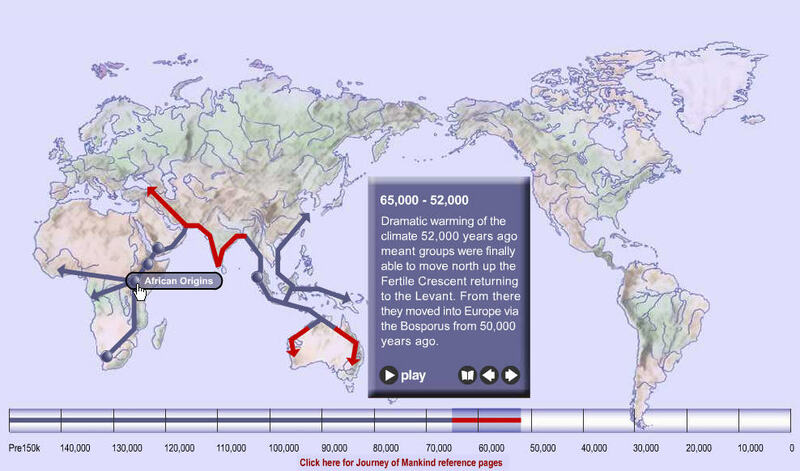 For a related site with static graphs, see Hominid Fossil Sites and Patterns of Hominid Dispersal. Description: Scott Sorli is a graphic artist and architecture lecturer with a keen sense of social justice. 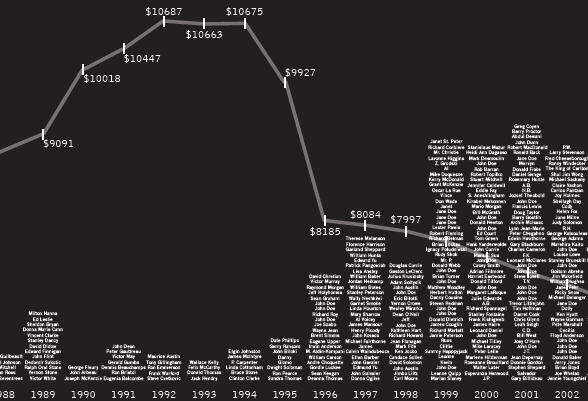 This information graphic,"Common Sense Revolution tracks Ontario welfare income for a single person against the number of homeless who have died on the streets of Toronto over the past two decades. The year 1995 is particularly striking, the year that welfare income begins to plummet, the year that homeless deaths begin to jump, the year that the Harris conservatives were first elected." While there is certainly a causal relationship between subsistence income and, well, subsistence, it is difficult to de-link with precision other causes of the rise in homeless deaths, specifically: the cancellation of construction of social housing by all three levels of government, the repeal of the Rental Housing Protection Act and its replacement with the Orwellian-named Tenant Protection Act; and the de-institutionalization of the mentally ill and developmentally disabled as the city's hospitals were being closed and cut back. Related: Article on this work in the Toronto Star, 8/23/07, p A12. 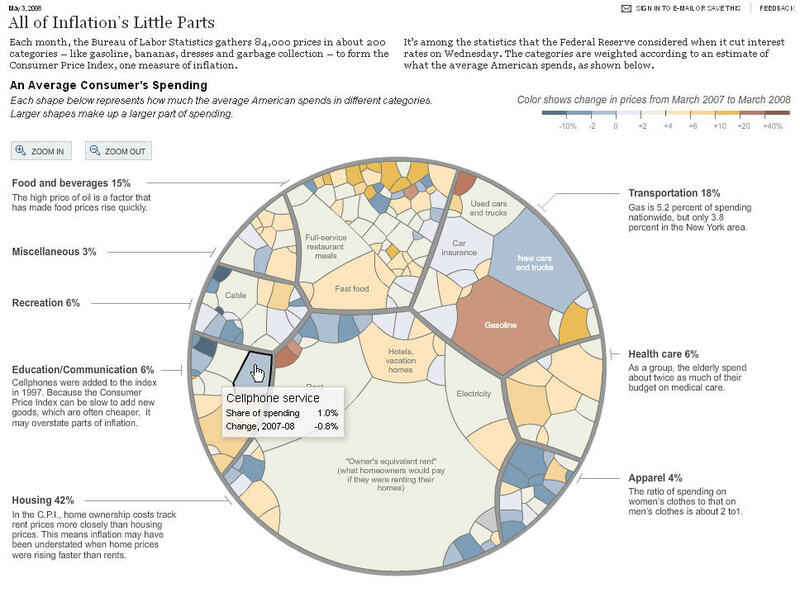 Interactive news graphics: All of inflation's little parts Detail, full size (), Static image, full size () , Link to interactive NY Times page. 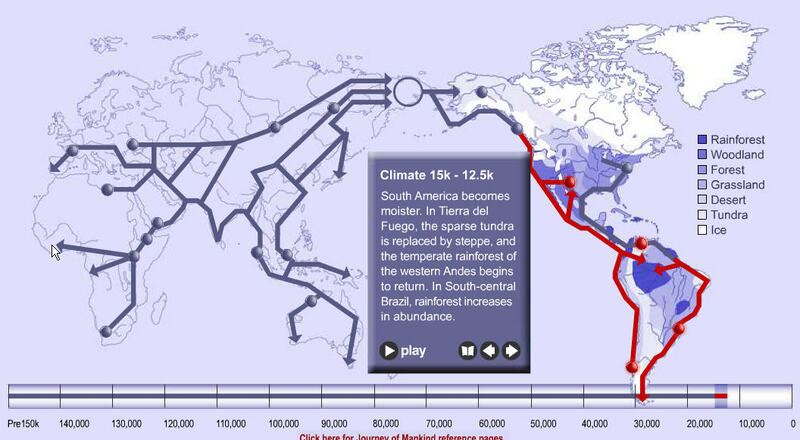 Description: The Graphics Department of the NY Times, including Amanda Cox, Shan Carter and many others, has recently created a number of visualizations of complex phenomena that are at once stunningly beautiful and effective in communicating the essential ideas to a mass audience. Web-based versions now allow them to use dynamic and interactive graphics to go beyond what can be shown in static print versions. This image, from May 3, 2008, shows the changes in prices from March, 2007 to March, 2007 of various components of an average consumer's spending. 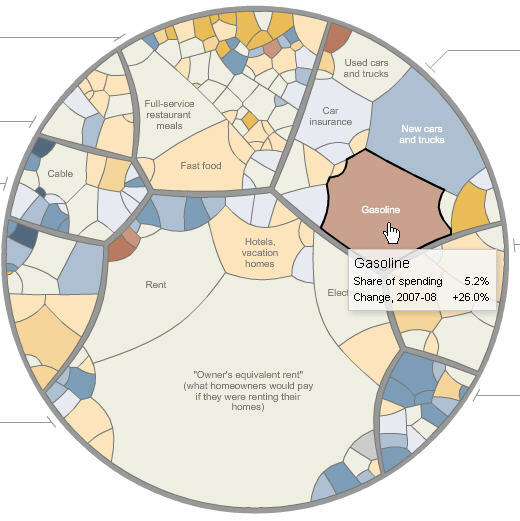 The circular diagram is broken up into 8 main sectors, whose area is proportional to the percent of spending, and each of these is subdivided in proportion to sub-categories. A bipolar color scale is used to shade each region, using shades toward redish-brown for increases and shades toward blue for decreases. The interactive version of this diagram uses tool-tip boxes to show the details and allows zooming in on components whose labels cannot be shown in a static graph. 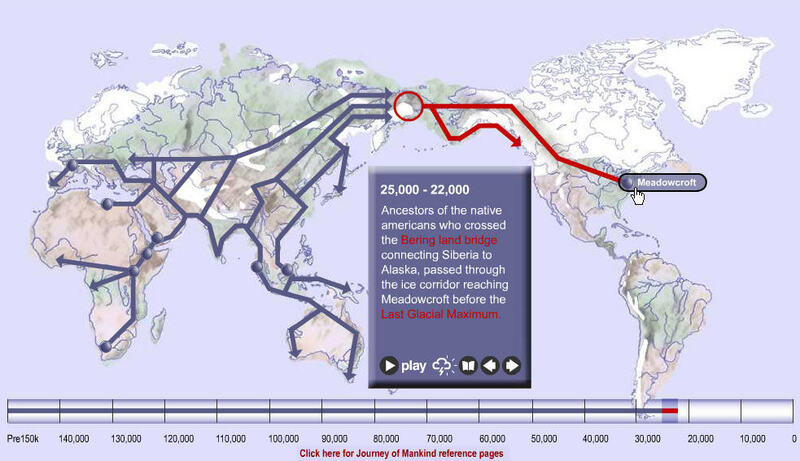 The basic graphic form is an adaptation of a pie chart to a hierarchical data structure, based on the idea of a Voronoi tree-map by Michael Balzer and others at the University of Konstanz.